A three-year-old wellnesss salon will expand from a one-room Midtown site to a storefront studio in Corktown, thanks to a $50,000 boost from the sixth annual Hatch Detroit contest for entrepreneurs. 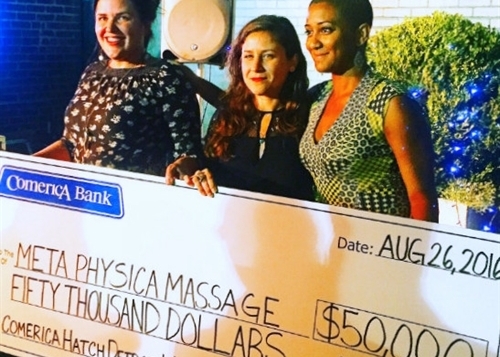 Meta Physica Massage, created by licensed massage therapist Jenaveve Biernat, was picked by judges Friday night after presentations by four finalists at a downtown event. After the field of entrants was narrowed to 10 semifinalists this month, a week of public voting online and at traveling booths determined the four startup businesses in the final round. Thanks to the grant, Biernat says, "Meta Physica Massage will transition to Meta Physica Wellness Center, offering therapeutic bodywork, full-spectrum infrared saunas, a raw juice bar, an herbal apothecary and health-inspired retail." She also plans meditation classes and community workshops at a site in the Bagley-Trumbull area with two massage rooms. "Our goal is to help the community grow by creating a gathering place for people to take charge of their health and wellness," the founder says in her Hatch pitch. "This will offset the day-to-day stresses people endure while living within a rapidly transitioning city. . . . Massage, saunas, raw juice and meditation have many proven health benefits and can enhance the overall quality of life. . . .
"In order to expand we have secured a loan through the Michigan Women’s Micro Fund, won a grant through Motor City Match and will be using personal savings. The 50K grant from Hatch Detroit will assist in making our dream a reality!" The runners-up were Bird Bee, Corbé and Coriander Kitchen & Farm. The six other semifinalists were Ash & Anvil, Brut Detroit, Chugga's Bakery, Detroit Dart Club, Itadaku Sushi and The Natural Market. The five earlier winners are Hugh, La Feria, Batch Brewing, Sister Pie and Live Cycle Delight. Hatch was founded in 2011 by Nick Gorga, an attorney at Honigman downtown.